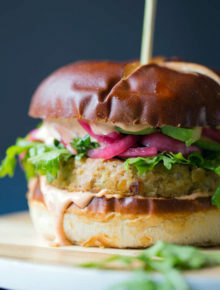 No need for a food processor when you make these ridiculously easy veggie burgers! Just mash chickpeas, hummus, and a handful of other ingredients together and saute for a super tasty, super simple vegan veggie burger. 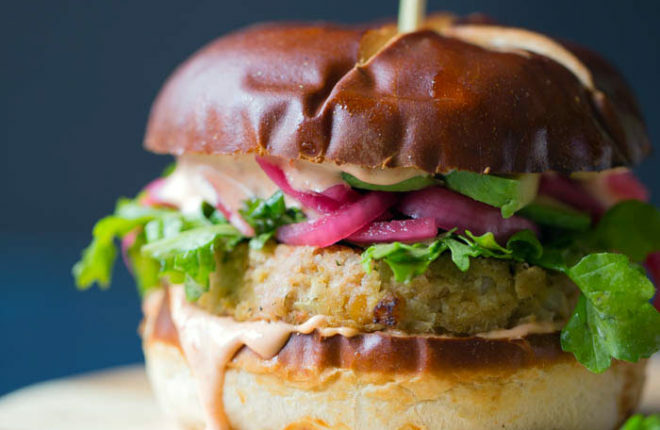 These Easy Hummus Chickpea Veggie Burgers are so meta. At least, I think they are – I am pretty much the antithesis of hip, so perhaps I’m completely wrong about what “meta” means. Chickpea burgers with hummus – you know, pureed chickpeas – as the binder? That’s meta right? Chickpeas in chickpeas? Okay, I’ll stop trying now. 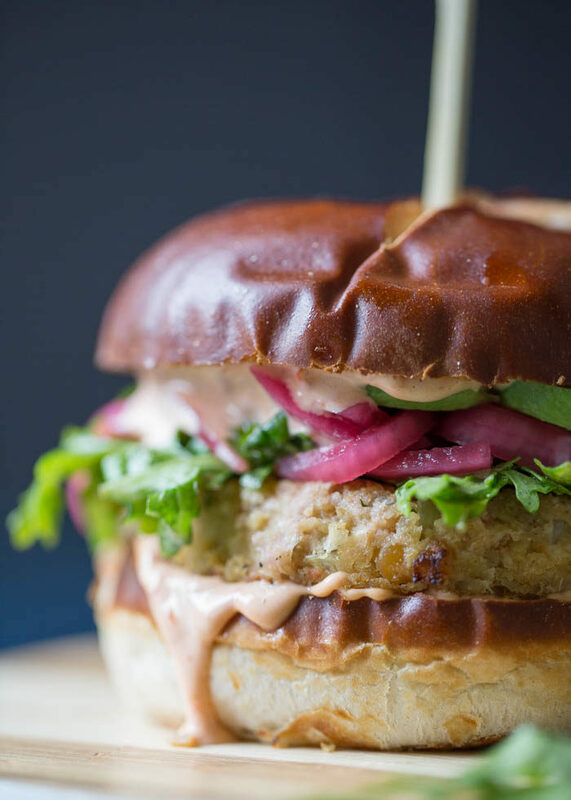 Basically, if you’re a chickpea lover, you’re in the right place, because this chickpea veggie burger has got ’em in spades. First, of course, you’ve got the hummus. Why hummus, you ask? Well, when I took my plant-based pro certification course earlier this year, I learned about how to build a veggie burger, including the five components to plant-based veggie burger deliciousness. For the binder, they suggested foods like cooked grains, cooked sweet potato, blended tofu, or even mashed beans. Wait a sec, mashed beans, I thought? What about pureed beans? Like maybe in, say, creamy dreamy hummus?! So I tried it. And it was delicious. And now I’m in love. The end. Okay maybe not quite the end. Because I would really love to talk about these things just a bit more. Bear with me. Okay, so first, I kept this recipe super-duper simple. 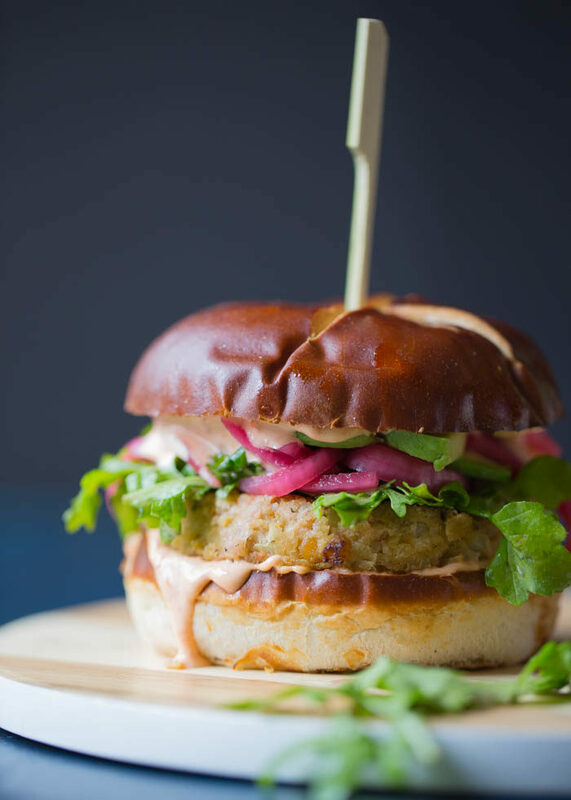 Because I’ll be honest – I don’t know how many times I’ve come across what looks like a glorious veggie burger recipe, and I’ve gotten all excited about making it, and then I see that it requires a food processor, and I just can’t even. Maybe it’s because our 14-cup food processor, ridiculously heavy powerhouse that it is, is being kept all the way out in our garage until our kitchen remodel is complete. Maybe it’s because I’m lazy. Probably both. 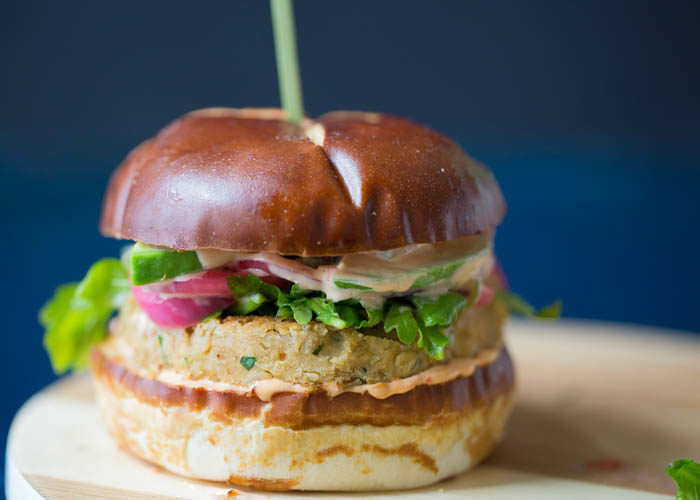 Well, you can keep your behemoth food processors in your garages, my friends, because this easy chickpea veggie burger recipe? It only requires one bowl, a masher, and a saute pan for cooking. Oh, okay, and a round cookie cutter for shaping your burgers, if you’re really wanting to go for it. But that’s it! No blending, no food processor. Just add a few ingredients, mash, shape, cook, devour. 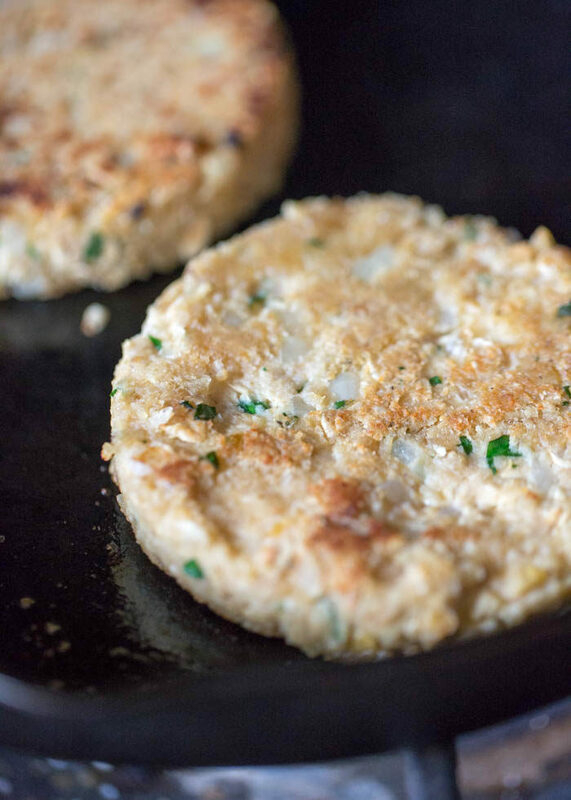 While yes, they are unbelievably tasty, these veggie burgers are a bit delicate, so I’m not sure how they’d hold up on the grill, but they’re perfect sautéed in a bit of olive oil on the stovetop and also delish baked in the oven. Here’s how I love em: Plopped on a pretzel bun that’s smeared with Harissa mayo. Then topped with a handful of lemony arugula. And a bunch of quick-pickled red onions. And, then, a couple slices of creamy avocado – because of course. 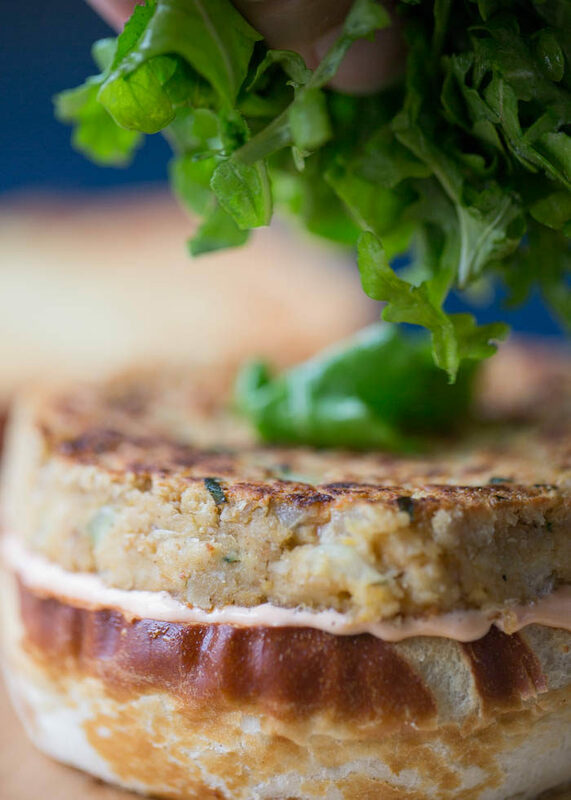 This simple chickpea burger recipe has really kind of changed my life. My carnivorous guy rather likes ’em, too. See, I really have no idea what that means. This is how I love these easy burgers, but just about any treatment will do. They’re also excellent sans bun and simply served atop a bed of lemony greens. Add all ingredients except olive oil to a medium bowl, starting with the lesser amount of hummus. Using a fork or potato masher, mix all ingredients together, mashing the chickpeas as you do so (but don’t completely mash them – you want to leave a bit of texture). Add more hummus if needed to bind the burgers together. You want the mixture to hold together easily when squeezed, but you don’t want it too wet. 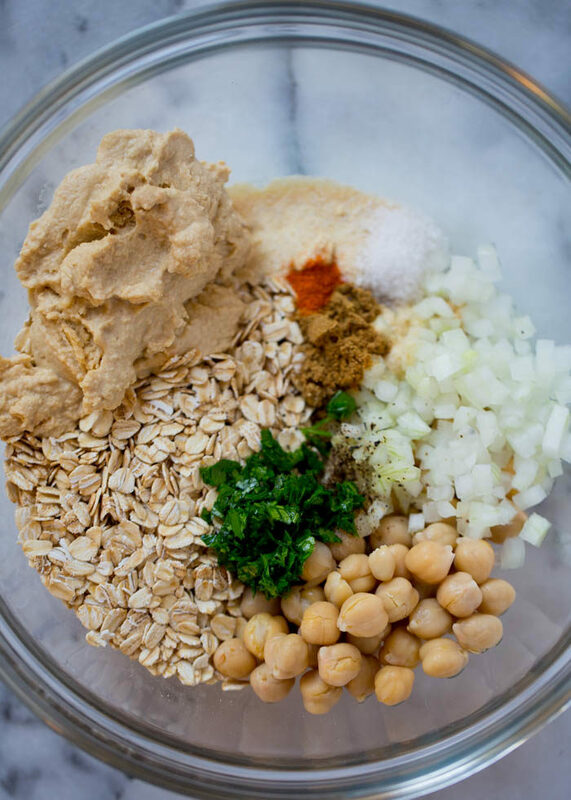 Because moisture levels in hummus can vary, I suggest starting with less hummus then adding a little more at a time until your mixture holds together when you squeeze it. Divide the burger mixture into fourths. Using your hands, form four patties about 4 inches in diameter. I like to press my burgers into this 4.5-inch circular cookie cutter for the perfect shape, but it’s not necessary at all. Heat a large saute pan over medium heat. When hot, add the olive oil. When the olive oil is hot, add the burgers, cooking in batches if your pan isn’t big enough. Cook on one side for 3-4 minutes, until golden brown. Flip and cook on the other side for 2-3 more minutes, until browned. Serve immediately – on a bun with accompaniments, over a salad, or on its own as a quick snack (um not that I’ve ever done that). You can also bake these bad boys. Just preheat the oven to 400 degrees Fahrenheit and brush a baking sheet with a bit of olive oil (or cover with non-stick spray). Bake for 20 minutes until golden, then flip and bake for until golden on the other side, about 5 more minutes. The veggie patty recipe is gluten-free as is; just make sure you use certified gluten-free oats. Swap in your favorite gluten-free bun + accompaniments and you’re good to go! Tried this today…SUPER YUMMIE! Thank you Karen. My carnivore 6 year old ate it up and asked for more. Yeah! I’m sure quick-cooking oats will work. They’re just cut smaller/thinner so the texture may be different. If you try it, please report back! I haven’t tried freezing, but I think it should work! I’d freeze in a single layer on a parchment-lined cookie sheet then transfer to a freezer bag. Probably a nice saute or even baking will get them burger-perfect when it’s time to eat them! If you try please report back!